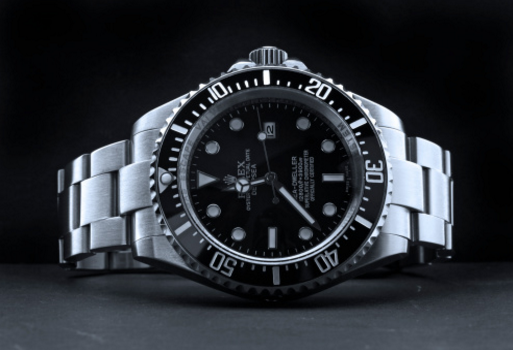 The Rolex Submariner is one of the most iconic and classic diving watches. It also happens to be one of the most popular models from the brand and remains a best-seller. The Submariner was first revealed to consumers in 1954 at the Basel Watch Fair. Strong and elegant, the model was the perfect accessory for the professional and the sportsman. Prior to its launch on the market, the Submariner was put through rigorous testing and was designated as the best water-resistant watch at the time. Rolex introduced its first Oyster-cased chronograph during WWII, and the official Daytona models were later made for race car drivers. It has also become a best-seller in the watch industry, as the models made of stainless steel are especially versatile, complimenting both casual looks and evening wear. They are so popular, waiting lists have formed for particular references. The desirability of this watch continues to increase exponentially both on the secondary and auction markets, even more so than many other early chronographs. The Van Cleef & Arpels Alhambra collection is a consistent seller on the secondary market. The Alhambra collection was created in 1968 and remains Van Cleef & Arpels’ identifiable emblem, symbolizing luck, love, fortune, and good health. The iconic Alhambra-motif collection features bracelets, rings and necklaces with a varying number of Alhambra’s in different colors and gemstones in each piece. These pieces have transcended decades and will remain classic and wearable. Examples include malachite and yellow gold and mother-of-pearl with white gold. Women mix and match and dress them up or down depending on their attire. The Cartier Love bracelet is a classic and popular item that continues to sell on the secondary market and has been a signature accessory for men and women for 45 years. The Love collection features bracelets, rings, earrings and rings, but the rings and bracelets are most popular and come in a yellow, rose and white gold and may include diamonds or sapphires. Cartier remains one of only a handful of brands, like Van Cleef & Arpels, Rolex and Patek Philippe, that maintain its value with time. Tiffany & Co. is a longstanding and iconic jewelry company that ranks as one of the top best-selling jewelry brands. Popular pieces include the Elsa Peretti Diamonds by the Yard and Paloma Picasso Open Heart collections. Gold and diamond pieces are steady items to buy and sell or take a pawn loan against. Not to be forgotten are the classic engagement ring styles that stand the test of time and value. Jewelry-N-Loan is proud to help their clients with all of their jewelry and watch needs, stop by their location at 1872 Newport Blvd. in Costa Mesa, California today.